, a divine of the church of England, but to whom that church was little indebted, was the son of Mr. Arthur Sykes, of Ardely or Yardly in Hertfordshire, and was born in London about 1684. He was educated at St. Paul’s school under the celebrated Mr. Postlethwayte, and was admitted of Corpus Christi college, Cambridge, in 1701, under the care of the rev; Charles Kidman, B. D. tutor of that college. In Feb. 1701-2 he was appointed a scholar of the house. While an undergraduate he wrote some Hebrew verses on the death of king William, which were printed in the Cambridge collection on that occasion. He took the degree of B. A. in 1704-5, and proceeded M. A. in 1708, After leaving college he was employed for some time as one of the assistants at St. Paul’s school, but quitted this situation as inconsistent with the prosecution of his private studies. In 1712-13 he was collated to the vicarage of Godmersham in Kent by archbishop Tenison, who had a great personal regard for him, and was a generous patron to the members of Corpus Christi) of which he had himself been fellow. In April 1714 he was instituted to the rectory of Dry-Dray ton in Cambridgeshire, on the presentation of the duchess dowager of Bedford, and in August following he resigned his vicarage of Godmersham in Kent. In Nov. 1718, he was instituted to the rectory of Rayleigh in Essex, which he retained to his death, but now resigned the living of DryDrayton. In Dec. following, at a meeting of the governors and directors of King-street chapel, Golden-square, he was unanimously appointed afternoon preacher at that place, which is a chapel of ease to St. James’s Westminster, of which his friend Dr. Clarke was then rector. In 1721, on the morning preachership becoming vacant by Dr. Wilcocks’s promotion to the see of Gloucester, Mr. Sykes was unanimously appointed to succeed him. In January 1723-4 he was collated to the prebend of AltonBorealis in the cathedral of Salisbury, by bishop Hoadly, and three years afterwards his lordship appointed him to the pnrcentorship of the same cathedral, vacant by the death of their common friend Dr. Daniel Whitby. In | April 1725, upon the nomination of Dr. Clarke, he was appointed assistant preacher at St. James’s church, Westminster. In 1726 he proceeded to take the degree of D. D. in the university of Cambridge. In Feb. 1739 he was advanced to the deanry of St. Burien in Cornwall, which is in the patronage of the crown; and on October 15, 1740, he was collated to a prebend in the cathedral of Winchester, through the friendship of his former patron bishop Hoadly, who had been translated to the see of Winchester in 1734. His ecclesiastical promotions seem to have ended here. During many years Dr. Sykes had been greatly afflicted with the gout and stone, but had received much relief from the pains of the latter disorder, for fifteen or sixteen years before his death, by the medicine purchased by parliament of Mrs. Stephens, for the public use. And upon the whole he enjoyed a general state of good health and spirits, until he was seized with a stroke of the palsy, while attending the funeral of a friend, on Monday evening, Nov. 15, 1756, and died, at his house in Cavendish-square, at two o’clock in the afternoon of Tuesday the 23d, in the seventythird year of his age. He was buried near the pulpit in the parish church of St. James’s Westminster 6n the 30th of November. 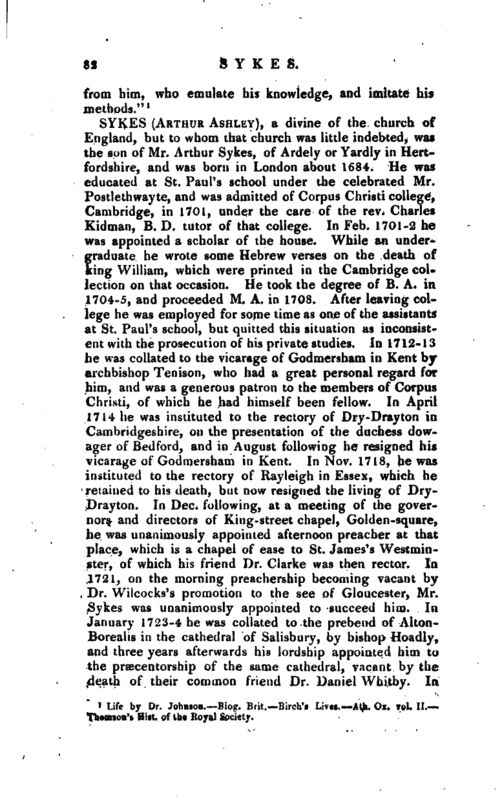 Dr. Gregory Sharpe, who succeeded him in King-street chapel, and was afterwards master of the Temple, and who had long been in habits of friendship with the deceased, officiated upon this occasion. Dr. Sykes had been married many years to Mrs. Elizabeth Williams, a widow lady, and a native of Bristol, but had no children by her. He left the whole of his fortune, which was considerable, to her for life, and afterwards to his brother the rev. George Sykes, rector of Rayleigh in Essex, and vicar of Preston in Kent. Mrs. Sykes died in January 1763, and was buried near her husband in St r James’s church. Monthly Review, vol. LXXIII. p. 207. 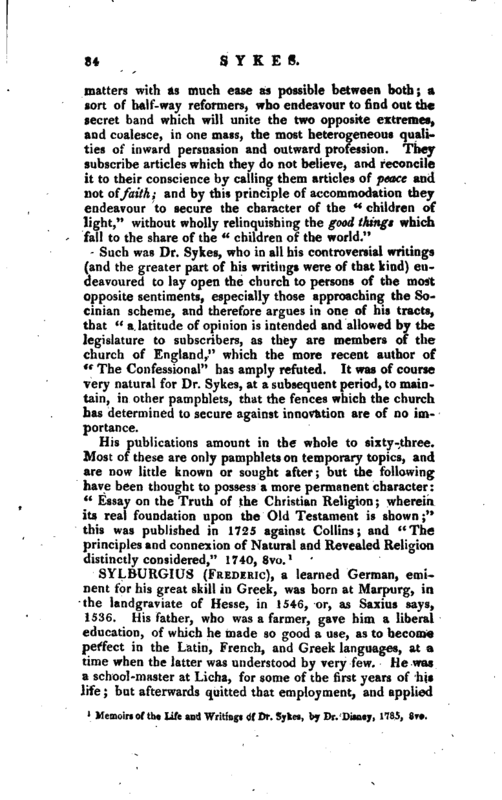 Such was Dr. Sykes, who in all his controversial writings (and the greater part of his writings were of that kind) endeavoured.- to lay open the church to persons of the most opposite sentiments, especially those approaching the Socinian scheme, and therefore argues in one of his tracts, that “a latitude of opinion is intended and allowed by the legislature to subscribers, as they are members of the church of England,” which the more recent author of “The Confessional” has amply refuted. It was of course very natural for Dr. Sykes, at a subsequent period, to maintain, in other pamphlets, that the fences which the church has determined to secure against innovation are of no importance. 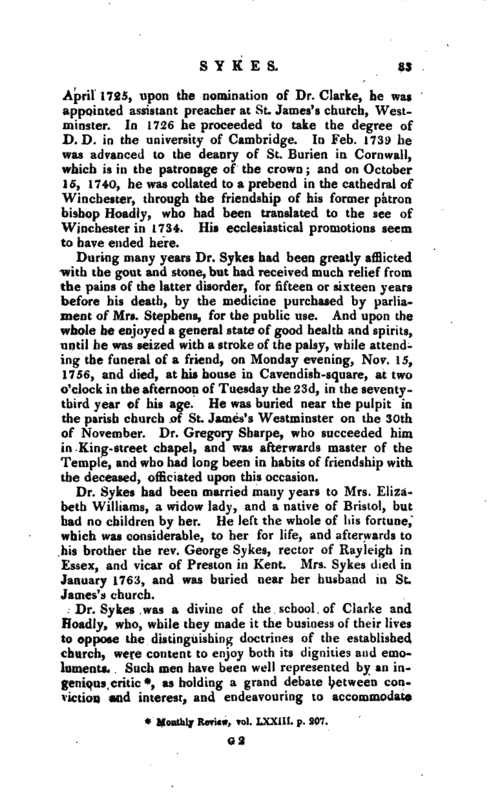 Memoirs of the Life and Writings of Dr. Sykes, by Dr. Disney, 1785, 8vo.